A short shamanic journey through mythical worlds. 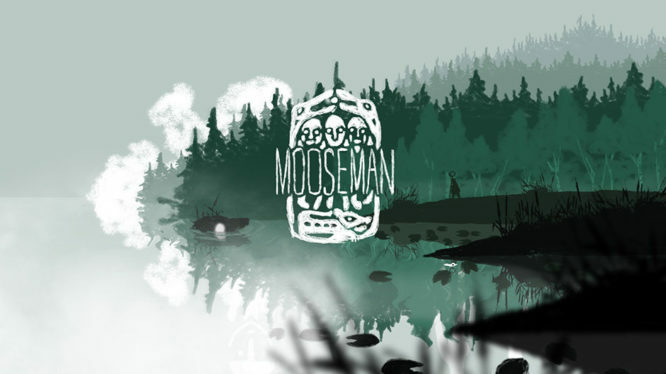 The Mooseman is a short, simple, and atmosphic 2D adventure game. Inspired by the Perm animal style and Finno-Ugric mythology, it follows the journey of a shaman as he crosses the three layers of the universe. Clocking in at 1-2 hours, the game is a fleeting experience that may leave some disappointed and others wishing for more. You play as the aptly named “Mooseman”, a half-god, half-man character with the ability to see beyond the mortal realm. At the tap of a button, you can enable spirit mode, revealing or hiding the various spirits and deities that inhabit the world. Some of these spirits are friendly and will help you on your journey; others are dangerous and will attack you or block your path. At the start of the game, this single ability is all shaman will have at his disposal, leaving only one other left to discover. As you wander through the game’s three main worlds, solving various puzzles, you’re slowly fed the narrative and mythology behind the game. 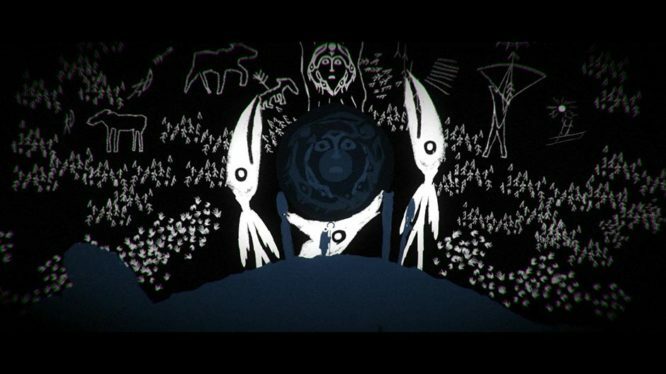 This is done through a series of idols (totems), the odd character subtitle, and hidden artefacts – which once discovered, unlock text within the game’s menu. The main story focuses on a solar myth, told through the Mooseman’s journeys across the lower, middle and upper worlds. A reconstruction of Perm animal style myth based on the developer’s research into Finno-Ugric culture. In addition to this, players can also discover factual snippets and myths adapted from various books while traversing across the various worlds. In terms of gameplay, The Mooseman essentially boils down to: walk right, use spirit mode, solve puzzle, rinse and repeat. It’s a side-scrolling puzzle game at its core, relying heavily on its mythology and atmosphere to draw players in. Despite the occasional deviation, this repetitive pattern is generally what you can expect for the majority of the game. It’s simplistic and that’s not necessarily a bad thing. The main character is sluggish and lacks the ability to run, which can be downright frustrating at times. Although the movement speed was most likely implemented to help immerse players in the surroundings, in some blander areas it simply feels like a cheap attempt at extending the game’s length. Double tapping a direction causes the Mooseman to walk automatically, which is useful for preventing thumb-ache during long slogs across the screen. You’ll encounter many different spirits along your journey. Some friendly, some foe. Besides walking (slowly), the Mooseman only ever acquires two other shamanic abilities. First up is his ability to shift into the spirit world (spirit mode) and is granted at the very start of the game. Shortly followed by the ability to cast a protective barrier, which is picked up about a third of the way in. Nearly every puzzle in The Mooseman is based around movement or using these two main mechanics, and while not particularly challenging, the puzzles are usually enjoyable. You’ll find yourself coaxing spirits into place, memorising sequences, hiding from enemies, and regularly shifting between the spirit and human world; to name a few. Given the length of the game, it was slightly disappointing to see some of the puzzles reused though. Collectables come in the form of “artefacts” that are scattered and hidden throughout the worlds. Some artefacts are particularly well hidden and often require the player to pay special attention to the environment around them. I definitely missed a few on my first play-through, so decided to jump back in to try and track them down. Once found, each collectable unlocks a short description of the artefact’s meaning (found within the game’s menu). The artefacts are probably one of the game’s strongest points, they’re fun to find, and add a nice touch of replay value to an otherwise short adventure. While The Mooseman does have bosses, they are only really bosses in appearance. Due to the lack of combat mechanics, most “bosses” are usually defeated by completing a relatively simple puzzle. If you were hoping for a challenge or long-winded boss fight then you may want to look elsewhere. Although they may look impressive, the ease in which you can solve the boss puzzles results in quite an underwhelming experience overall. Love it or hate it, you can’t argue that The Mooseman doesn’t stay true to its source material. The hand-drawn visuals pay an extremely accurate homage to Perm animal style artefacts, not only for in-game collectables but also the various spirits you encounter along the way. 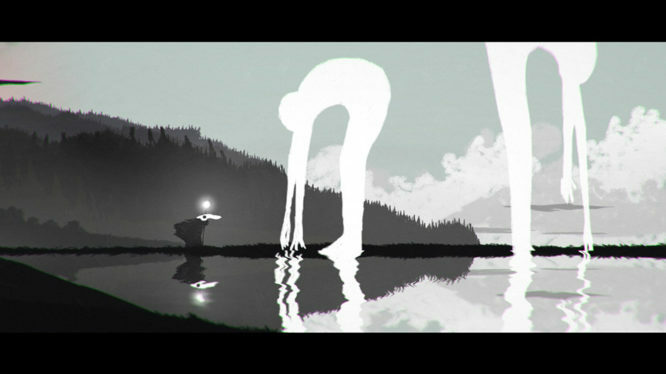 It’s clear that the developers also drew inspiration from games like LIMBO, adopting a very stylised and minimalist approach to the overall design. Colour pallets are chosen particularly well and a parallax scrolling effect is used to create the illusion of depth throughout. An anthropomorphic face looks over this spirit-based puzzle. Unfortunately, when it comes to animation, the developers seem to fall short in a few places. The main character completely lacks any fall animation (despite it occurring numerous times throughout the game) and some of the spirits employ very rudimentary animations compared to others. Changes between scenes can also be a little jarring at times, often freezing for a second and quickly cutting to the next. Overlapping menu bug, caused by pressing start during narration. The Mooseman’s UI is a bit of a mess. Pausing the game during some narrative cut-scenes, causes the menu and narrative text to overlap, rendering both unreadable. Not that big an issue if pressing “+” again resumed the game; however, it doesn’t, and you must select “CONTINUE” from a list of undecipherable words instead. Fun times. Similarly, it’s not possible to exit a sub-menu by pressing “+” or even go back pressing “B”. Instead, you’re forced to highlight and select the word “BACK” and then “CONTINUE” on the main menu. While this seems like a minor issue, it gets very tedious when you’re regularly checking the myths and collections screens. The final button press when closing the menu also registers in the actual game, causing the character to shift in (or out) of spirit mode and (depending on the level) can often resulting in an undeserved death. Hopefully some of these issues will get patched out in future, as The Mooseman has some nice elements to it. At times, I really enjoyed accompanying the little shaman on his journey; it’s just a shame that the developers didn’t invest a bit more time into it. The Mooseman is a good, albeit short and slightly unpolished, addition to the Switch's library. It's comparable to a nicely illustrated, interactive, short story with some basic puzzles and collectables thrown in. If you're looking for a challenge, action-packed adventure, or something to play for more a couple of hours - then this certainly isn't the game for you. Got a sweet spot for easy-going indie games or Uralic mythology? Then grab your staff and start walking right!